The politician and Nobel peace prize winner Aung San Suu Kyi has had her Freedom of Edinburgh award revoked. Councillors voted on a motion to remove the honour amid accusations she has ignored violence against the Rohingya Muslims in Myanmar. Suu Kyi was given the freedom of the city in 2005 for championing democracy while living under house arrest. A motion, tabled by Lord Provost Frank Ross, called for it to be removed with immediate effect. The motion noted "the ongoing humanitarian crisis in Northern Rakhine and in the refugee camps of neighbouring Bangladesh" as well as calls from the United Nations, Amnesty International and international governments to stop the violence. Ross told a meeting of the full council: "It has been 10 months since this chamber discussed the status of this award for Aung San Suu Kyi. "It did so in the light of the humanitarian crisis in Myanmar (Burma), which was and continues to be broadcast around the world. "At that time this chamber instructed me to write to Aung San Suu Kyi, making it very clear that as a recipient of the Freedom of our City, we urged her to use her powers to alleviate this human crisis." Ross added: "I did so and we have tried every route that we possibly have available to us to make contact, via our armed forces, through diplomatic means, by writing directly - yet we have seen the situation in Myanmar continue to deteriorate. "This award is granted rarely and only to those individuals who are held in the highest esteem by the citizens of Edinburgh. It was presented to Aung San Suu Kyi in recognition of her personal courage and relentless pursuit of justice. "I no longer believe her receipt of this award or the reasons it was presented are appropriate or accurate. It is not a decision we take lightly to revoke the honour granted to her in 2005." 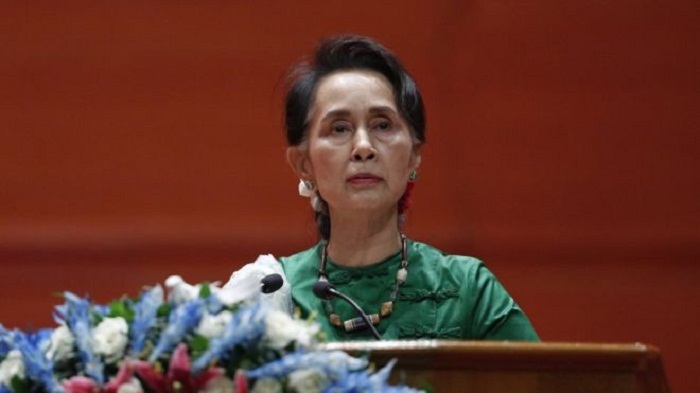 The 73-year-old leader of Myanmar - formerly Burma - was hailed as a beacon of democracy when she was given the city's highest honour 13 years ago. She was awarded the Nobel peace prize in 1991 while under house arrest in Rangoon. Two years later violence broke out in Rakhine province after Rohingya militants attacked police posts, killing 12 members of the security forces. While it is acknowledged that Suu Kyi does not control the military, she has faced international pressure to condemn the army's alleged brutality towards the Rohingya, a Muslim minority which is stateless in majority-Buddhist Myanmar. Other cities including Oxford, Glasgow and Newcastle have also acted to strip Suu Kyi of similar honours. The last time Edinburgh revoked a Freedom of the City honour was in 1890 when the Irish politician Charles Parnell fell into disrepute over a scandalous love affair. A collage portrait of Suu Kyi by the artist David Mach, made up of postcards of political prisoners, that was previously displayed on rotation at the council's offices, is currently in storage.